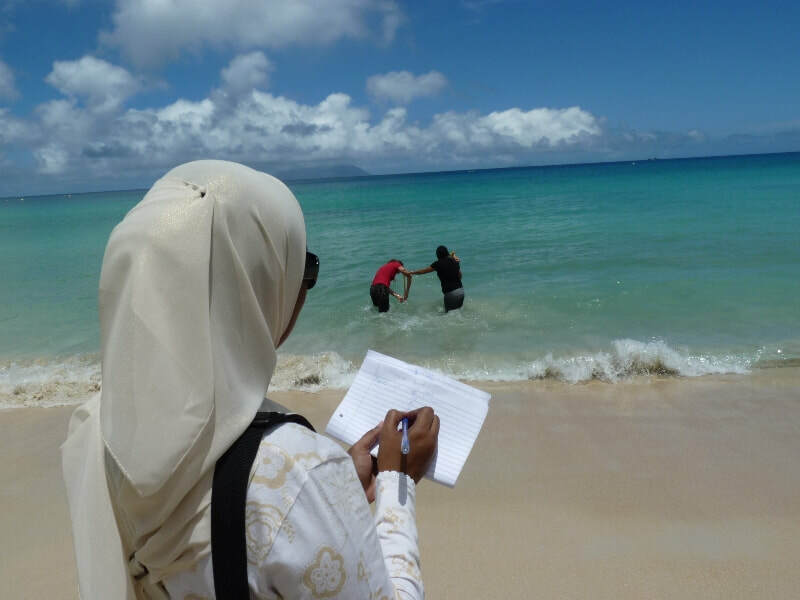 Sandwatch in Seychelles has been coordinated by the Ministry of the Environment, Energy and Climate Change with the help of the Ministry of Education, the UNESCO National Commission for the Seychelles and schools throughout the country. ​August 29, 2018: Sandwatch Programme field trip to the west coast, Anse Boileau Beach has been chosen for our monitoring programme. Anse Kerlan beach, on the island of Praslin in Seychelles, has been for a long time under the attack of wave erosion, especially during the South-East Monsoon. Following the December tsunami in 2004 the situation has worsened, so much so that some of the Praslin Secondary School teachers living in that area decided to move out since they felt that now more than ever they were at the mercy of the mighty sea. The Small Islands Voice Youth Group, being a group, which is eager to discover new things, and who want to contribute to the development of our community, put what we learnt at school in practice, and decided to carry out a mini-project in this area. The aim of the project was to collect information to assess the effect and rate of erosion. We did this at three sites along the area of study. The tsunami has helped to change the gradient and shape of the beach and to make what were once grass-covered yards in front of the houses in the vicinity, areas completely covered by great depth of sand. stabilisers be constructed. (Underwater stabilisers are geotextile tubes, filled with concrete or sand, and placed underwater perpendicular to the shoreline. They are designed to help to reduce wave energy and turbulence, thus making the area calmer). Feburary 2012, the S3A2 Sandwatchers of English River School conduct a study on the severe erosion affecting North-East Point Beach, Praslin Island. The North East Point beach is situated to the North East of the Mahe Island. North East Point is a residential area as well as a recreational area. The home of the elderly and a rehabilitation centre are also found close to the beach. The beach is often used for picnics and other recreational activities. The location has been chosen since the club has adopted the beach to carry out different SandWatch activities since 2008. Furthermore, since the theme is ‘communities caring for nature’ we wanted to move to the community to show our concern for a cleaner beach. Some students also live in the area; we therefore wanted to instill a sense of ‘caring’ for their beaches and their environment. The Sandwatchers cleaned up a large area of the beach. Some students from the primary school and people from the community were also actively involved. The Sandwatchers parents provided some refreshment for the students. We are grateful to the Waste Management department at the Ministry of Environment especially, Ms Nada Francourt who provided the equipment, transportation and lunch for the Sandwatchers. The students also carried out a pollution survey at the beach. The findings showed that pollution is a major concern at the North East Point beach. Plastic bottle, plastic bags and glass bottles were the largest amount of litter found. The main source is by the picnickers. We feel that smaller bins are needed along the beach and more education needs to be done regarding the dangers of litter for the coastal environment. View full details, amazing photos and a video from the Oct 2010 Sandwatch Workshop! In 2009 the Sandwatch approach was expanded to include climate change resilience building,, with the support of the Government of Denmark, UNESCO and the Sandwatch Foundation. The Sandwatch manual was revised and trialed at a Sandwatch workshop in The Bahamas in June 2009. The manual has now been published and will be launched at an Indian Ocean Regional Workshop to be held in Seychelles 4-8 October 2010. The workshop will bring together several new and experienced Sandwatch practitioners. In addition, work has progressed on developing a Sandwatch database that will provide a scientific tool and record of the beach monitoring activities being conducted by Sandwatch groups worldwide. The prototype database will be presented and discussed at the workshop. 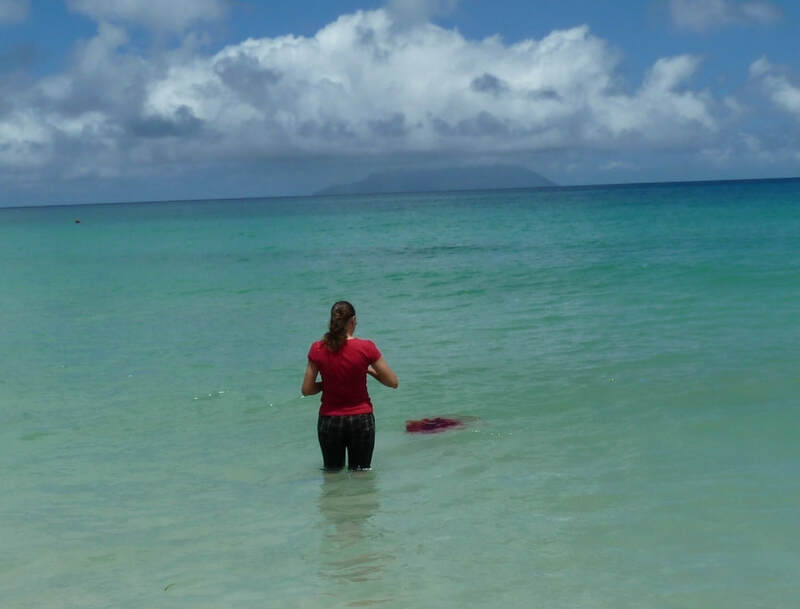 Aug 2018, ​Sandwatch Programme field trip to the west coast, Anse Boileau Beach has been chosen for our monitoring programme. Feb 2012, The S3A2 Sandwatchers of English River School conduct a study on the severe erosion affecting North-East Point Beach, Praslin Island. June 2008, Sandwatch Club of English River School win prize for an international video competition on effects of Climate Change, click here for full details. In 2004 Sandwatch training workshops were held in Anse Royale and Anse Boileau Secondary Schools in Mahe. In 2003, Ms. Jeanette Larue of the Ministry of Education and Youth participated in the second Sandwatch Workshop in Dominica in 2003.